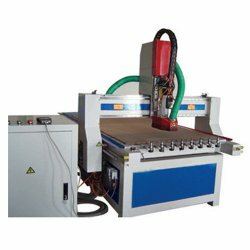 The CNC Router offered by us is appreciated for having features like compact design, sturdy construction, longer service life, easy installation and low maintenance. These routers are manufactured using quality raw material. In addition to this, we also check these routers on the basis of various well-defined parameters to assure a defect-free array of products to our customers. After giving the final touch to these products we store them in our state-of-the-art warehousing unit. Working Area(mm): X-1300, Y-2500, Z-200mm.